was sold to Alf Grant, of the Cameron District. In 1922, Dad and son Marinus came to Winnipeg and picked up the Nichols and Sheppard "Red River Special" separator. Marinus bought a Gaar Scott engine. It was brought into Canada by H.1. Hanson for John Fugstadt from where Marinus got it. The Gaar-Scott steam engine was also used to pull Archie McDougall's house down to the village of Clanwilliam from N .E. 13-17 -18W in 1922. The house still stands there and is the residence of The Pool Elevator Agent. I understand the Gaar-Scott engine was eventually sold for scrap iron. Daniel Neilson and family were Charter Members of Immanuel Lutheran Church in Clanwilliam. He was on the first committee chosen in 1906, to draft a constitution for the congregation and on June 17, 1907, a meeting was held to elect officers. Dan was elected to the position of Secretary. He was also active on the Grey School Board at Clanwilliam and held the position of Chairman for some time. Christine, born on the homestead S.E. 22-17-17W and later married Chris Frederickson. (refer to Frederickson, Chris and Christina). Therkild "Marinus". (refer to Neilson, Marinus and Mabel). Thora Neilsine, born November 5, 1896, on S.E. 22- 17-17W in the Rural Municipality of Clanwilliam and attended Grey school. In the mid 1920's, she left home to seek employment in Winnipeg. It was there she met her future husband Carl Juul Hansen. They were married on October 21, 1929, at Owen Sound, Ontario. 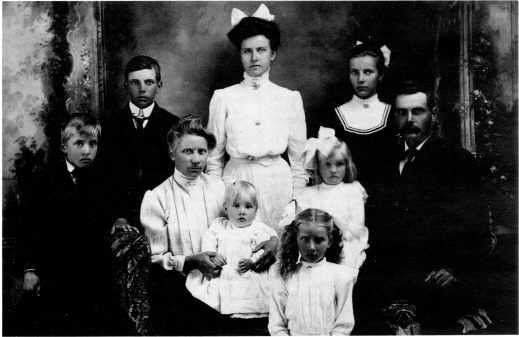 Thora and Carl were blessed with three children; Erik, deceased January 13, 1955, Ivan and Ernest. Thora passed away December 25, 1980 at New Westminster, British Columbia. Theodore Daniel was born September 11, 1900, on N.W. 8-16-17W. (refer to Neilson, Theodore and Ethel). The Daniel Neilson Family. Standing: Theodore, Marinus, Christine, Thora. Sitting: Bodil, Arthur, Martina, Daniel. Front Row: Dagny.